The Six Goswamis* were a group of scholarly and ascetic devotees of Krishna who lived and wrote in India during the late fifteenth and early sixteenth century. 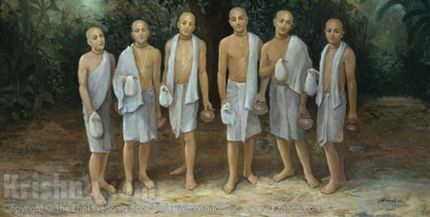 They were the leading disciples of Chaitanya Mahaprabhu. A number of the Goswamis came from aristocracy but left aside considerable wealth and influence to live as wandering mendicants, dedicating themselves to writing commentaries on the Vedas. They also uncovered many of the lost places of Krishna's pastimes in Vrindavan, and established temples there that are visited to this day. Under Chaitanya Mahaprabhu's direction, they showed that the essence of all Vedic teachings is devotional service to God, bhakti-yoga . Their work largely forms the scriptural and philosophical basis of ISKCON, popularly known as the Hare Krishna movement. The brothers Rupa and Sanatana were formerly high-ranking ministers in the Islamic government of Bengal, India. Their nephew Jiva, is considered by some Sanskrit scholars to be the greatest philosopher of all time. Gopal Bhatta was from an aristocratic South Indian family, Raghunatha dasa's father and uncle were the wealthiest landowners in India, and Raghunatha Bhatta studied under Rupa and later established the famous Govindaji temple In Vrindavan. *Sanskrit go = "senses," swami = "master"
The Hub of the Spiritual World – visiting the samadhis (shrines) of the Goswamis in Vrindavan. Ramakeli, the Historic Home of Rupa and Sanatana. Sanatana's Great Escape - One of the original leaders of the Hare Krishna movement uses his diplomatic skills to free himself for the Lord’s service. "Srila Rupa Goswami Prabhupada elaborated the teachings of the Lord with profound knowledge of revealed scriptures and authoritative references from various Vedic literatures. Srila Srinivasa Acharya describes in his prayers to the six Goswamis that they were all highly learned scholars, not only in Sanskrit but also in foreign languages such as Persian and Arabic. They very scrutinizingly studied all the Vedic scriptures in order to establish the cult of Chaitanya Mahaprabhu on the authorized principles of Vedic knowledge. The present Krishna consciousness movement is also based on the authority of Srila Rupa Goswami Prabhupada. We are therefore generally known as rupanugas, or followers in the footsteps of Srila Rupa Goswami Prabhupada." "Both Rupa Goswami and Sanatana Goswami brought various scriptures to Vrindavan and collected the essence of these by compiling many scriptures on devotional service. In this way they delivered all rascals and fallen souls. The Goswamis carried out the preaching work of devotional service on the basis of an analytical study of all confidential Vedic literatures. This was in compliance with the order of Sri Caitanya Mahaprabhu. Thus one can understand the most confidential devotional service of Vrindavan." "Sri Chaitanya Mahaprabhu asked Raghunatha Bhattacarya not to marry but to remain a brahmachari (celibate student), and He also ordered him to read Srimad-Bhagavatam constantly. . ."
" . . . After the disappearance of Srila Rupa Goswami and Sanatana Goswami in Vrndavana, Srila Jiva Goswami became the acharya (leading teacher) of all the Vaishnavas in Bengal, Orissa and the rest of the world, and it is he who used to guide them in their devotional service. . ."
" . . . He almost completely gave up eating, and therefore he was very skinny and of weak health. His only concern was to chant the holy name of the Lord. He gradually reduced his sleeping until he was almost not sleeping at all . . ."
"When Krishnadasa Kaviraja Goswami took permission from all the Vaishnavas before writing Sri Chaitanya-charitamrita, Gopala Bhatta Goswami also gave him his blessings, but he requested him not to mention his name in the book. Therefore Krishnadasa Kaviraja Goswami has mentioned Gopala Bhatta Gosvami only very cautiously in one or two passages of the Chaitanya-charitamrita. . ."
What books did the Six Goswamis write? Why are the Goswamis and their books considered so important in the Krishna consciousness movement?